Dutch, who are the Chargers for? several midwest states for Amtrak services plus MARC ordered a few. Jeff Smith wrote: Dutch, who are the Chargers for? 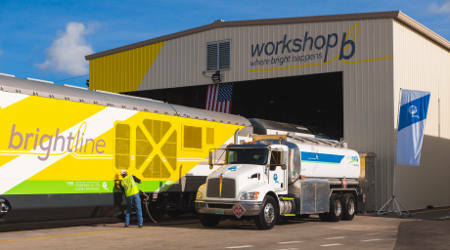 The Charger locomotives are Diesel-Electric locomotives that are based off a European model (probably Vectron) that the Following owners: MARC, Northern Lights Express (BNSF), Brightline (FEC), Caltrans (AMTK), Amtrak Midwest (AMTK), and Cascades (AMTK). The horns are 3rd Generation K5LAs. The Prime mover is made by Cummins and have an LED Display board on the front but excluding for Brightline. Instead, Brightline's Chargers are bulleted and designated the name SCB-40. It is still an SC-44. But one without a display board on the front. from another forum : Siemens will ship from their Sacramento facility, the first 3 MARC Charger locomotives as well as the first SEPTA ACS64. Union Pacific will pick up the locomotives sometime on Friday. The Siemens Mobility train factory in Sacramento received a contract to build four of its new Charger locomotives for use on the Altamont Corridor Express commuter route, with an option for four additional train engines. Passed a bunch of Chargers In Chicago yard whilst riding the Moonlight Dome on a positioning move. Someone mentioned that the vents on the sides were getting clogged with ice, etc. (similar to the unrebuilt M-2's that MNRR had; they'd eat up snow below the car).